Are your taking care of your iron fence? Iron fences are known for needing a little extra tender-loving-(fence)-care to stay in great shape. Luckily, a little bit of elbow grease goes a long way, and these strong and sturdy fences can keep your home safe and beautiful for decades. 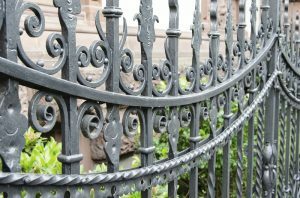 Ready to take better care of your iron fence? Here are five of our best tips to get the job done. As the saying goes, an ounce of prevention is worth a pound of cure. Wrought iron fences begin to rust whenever they are exposed to the classic Virginia combination of heat and humidity. However, you can take several simple steps to prevent rust from ever beginning. Apply protective wax to your fence or use a protective sealant to block out moisture. Just like applying a protective sealant or wax to the surface of your iron fence, painting it helps to block out moisture and prevent the fence from further damage. Paint creates a thin barrier between the iron itself and the moist air to stop oxidation from occurring. Paint is also a fun way to customize your iron fence and blend it in with the rest of your landscape. If your iron fence is already dirty, you need to clean it before applying a new layer of protection. Clean away any dirt or rust with a toothbrush and rinse the length of the fence with water. Do this on a warm day so that the water will evaporate and the fence will dry quickly, leaving the water on the surface for the shortest amount of time possible. Regularly cleaning your fence will ensure that there are no surprises in the future. Regular inspection is critical with every type of fence, and iron fences are no different. Take regular strolls around the length of your iron fence to look for any signs of rust, loose footings, cracks, or damage. Check for chips in the paint or places that might become problem areas in the future and make repairs as quickly as possible to prevent more damage. Rust spots are just about inevitable on iron fences, but that doesn’t mean that you have to let them linger. Use steel wool or sandpaper to get rid of the rust and stop it from reoccurring by applying wax. This entry was posted on Friday, July 7th, 2017 at 7:58 pm. Both comments and pings are currently closed.